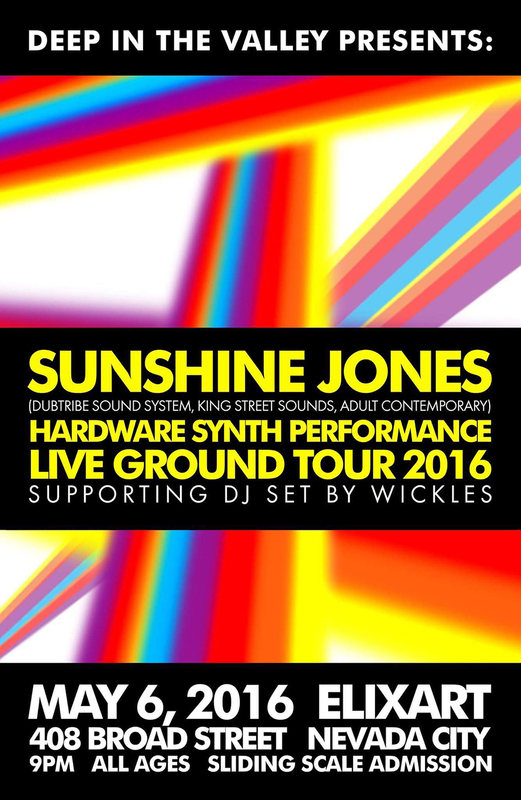 Friday May 6th the Sunshine Jones Live Ground Tour returns to Grass Valley for the second time this year. My brother Matt Wich – bka DJ Wickles – has pulled a minor miracle and made it happen. So I’m headed up there and we’re gonna throw down both an open conversation with you about electronic music and live improvisational house music, as well as the two of us are going to play a set and turn that art gallery space out. Grass Valley is a rare and beautiful place. I hope you can make it up there, and/or out of your amazing compounds, yurts and air streams to make the scene. Matt is a solid and beautiful man and his deep in the valley productions are just beautiful. I am looking forward to seeing you.